Few people can imagine a home without an air conditioning unit or a heater, and even fewer people would even call it a house – more like an oven with cable TV or an icebox with a guestroom. However, those who design passive houses seek to accomplish just that. The goal of passive solar building design is simple, to plan a building that provides a comfortable temperature all year without the need for conventional heating. This is completed by taking full advantage of solar energy, yet unlike active solar technologies, it is done without mechanical and electrical devices. Currently, the practice of passive solar building design is far from reaching the goal of total solar dependence, however their accomplishments to date provide useful and helpful tips for home builders today. The concept of passive solar building design can be dated back thousands of years, largely as a necessity in the time before mechanized heating and cooling. These ideas remained in use in Western culture until the fall of the Roman Empire, where they disappeared until the 1930s. Though technology and progress have drastically improved since thatched huts were constructed under these beliefs, the fundamentals remain visible in modern applications. Part of these fundamentals include an understanding of the following techniques of heat manipulation in passive solar design: direct solar gain, indirect solar gain and isolated. Direct solar gain is passive solar building design at it’s simplest, and nearly every building suitable for human living has used it – though maybe not to its fullest. Direct solar gain involves the use of windows and other transparent building materials to control the amount of direct solar radiation and heat that enters a building before it is absorbed into the floor, air and everything within a room. To maximize this effect, there are multiple actions that can be taken. Consider placing or emphasizing windows which face South. 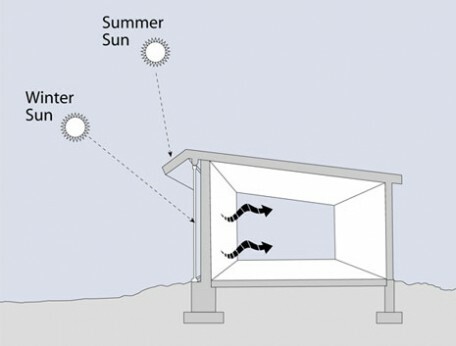 Because of the varying height of the sun throughout the year, if facing South, windows will receive a large direct solar gain in winter and less in summer when the sun is higher, above the window. This will allow for the most direct sunlight and heat to enter in the winter when it is needed most. Also, some buildings built with passive solar designs have included water-filled containers built into the structure or placed in the living space to absorb and store solar heat as water will store approximately twice as much energy as masonry materials. In the end, the simplest action to maximize this effect, as reinforced by the Department of Energy’s Energy Savers guide, could be keeping windows clean and installing window treatments that enhance passive solar heating, reduce nighttime heat loss, and prevent overheating. Designing an indirect-gain solar building will require a few adjustments uncommon to many homes, however the payoff in energy saved should make it worth your while. This system employs a small thermal storage space between southern facing windows and the living space. Most commonly, this is employed using a Trombe wall, an 8-16 inch masonry wall placed on the south side of a house about an inch behind a piece of mounted glass and painted a dark color. During the day, solar heat is absorbed by the Tombe wall and stored inside. Once the indoor temperature falls below that of the wall’s surface, heat will radiate and transfer into the room beyond the Tombe wall over a period of several hours. Again, as with the windows using direct solar gain, this will be most effective in Winter when the sun is closer to the horizon. During Summer, the sun will be higher in the sky and direct solar absorption should be minimized. Other alternatives to the Trombe wall for indirect solar gain include water walls, roof ponds, and earth covered roofs. Each of these operate under the same principles as the Trombe wall but may be more efficient given the circumstances of the builder and building. Isolated solar gain is unique from the previous methods of channeling solar energy in that energy is collected independently of a living area. Once collected, it is passively transported, without the use of any moving parts, to the desired area in or outside of the building. While there are many means of utilizing this method in building design, the most common is in a sunroom – also called a sunspace, solar room, or solarium. This is usually an outdoor addition to a structure which captures solar energy then carries it into an indoor living space. The means of both collection, storage and transportation is completely up to the designer. Commonly, vertical windows are used to collect the energy while some kind of thermal mass is used to store it: masonry floor, a thermal wall, water tanks and even air can all be employed. For transportation, fans can be effectively used however for a completely passive solar building design, a system of vents will transport via air without mechanization, as will water as it is used in a thermosiphon system. For those who are considering a passive solar building design or even adjusting a building to incorporate these ideas, there are a few products to consider for the collection, storage and distribution of solar energy. Special window glazings can either increase or decrease the the effectiveness of windows while tinting and coverings will help reduce overheating during the Summer. For storage, consider building materials suited for energy absorption and proper insulation. For those interested in passive solar building design but lacking the resources to build a new home from scratch, there are alternatives. Accessories and add-ons can be purchased to maximize the effect of direct solar gain in apartments as easily as in homes, while Tombe walls can be installed in already built homes. 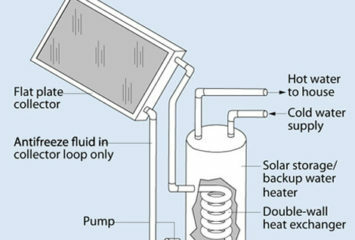 In addition, there are passive solar products, like passive solar water heaters, that once installed, will function primarily without mechanical and electrical devices. However when making a choice regarding solar energy, keep in mind that passive solar systems are not without their drawbacks. Passive systems require large amounts of planning and dedication, in addition to regular maintenance for continued efficiency. When making the decision to go solar, consider all options, including active solar systems which may provide exactly the right energy output at the right cost for your house or building. 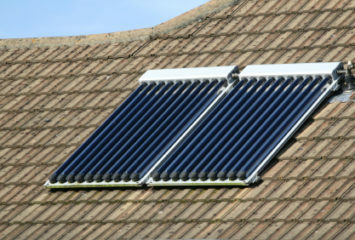 What's Better, Solar Thermal or Solar PV?